There are two sites that publish some of the most comprehensive, thorough, and trustworthy reviews of digital audio recorders: Transom, and O’Reilly Digital Media. (Well, three if you count this blog, but I’ve only reviewed the units I’ve actually purchased, including the Zoom H4 and the Sony PCM-D50). The Marantz PMD620 has been around since late last year, and Transom published their review of the recorder shortly after it was released, but O’Reilly published their review just a few days ago. In December, Transom concluded that the unit was one of the best handheld digital audio recorders you could buy for less than $500. That was before they reviewed the Sony PCM-D50, which got even higher marks. 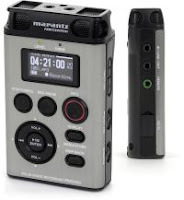 But the Marantz recorder is both smaller and cheaper. Transom’s primary audience is radio and podcast producers, while O’Reilly Digital Media is targeted at a broader audience, including people who plan to use these digital recorders to capture music and nature sounds. So how does the Marantz PMD620 stack up? The build quality doesn’t seem as high as some other recorders. The door covering the USB port broke on Mark Nelson’s review unit within just a fwe weeks. But the controls are easy to use, the recorder gets about 5 hours of battery life out of 2 AA batteries. The sound quality was good. There’s not a lot of wind noise when moving the recorder around using internal mics. And there’s not a ton of hiss from the preamps. Nelson posted a series of audio recordings as part of his review. Nelson did find a few problem areas. While the recorder lets you create three presets for quickly changing your audio settings on the fly, if you want to change your settings by hand you’ll have to dig deep down into a series of menus which takes longer than it should. This review confirms my belief that the PMD620 is a good, but not great recorder. If you really can’t afford to spend $500 for a Sony PCM-D50 or a bit more for a Fostex FR2-LE, the PMD620 has a street price of $400 and sounds a lot better than the Zoom H2 or H4. If you need XLR inputs or phantom power, you’re going to want to go with the Fostex or the Marantz PM660, but from what I’ve heard, the PMD620 might actually have cleaner preamps than the PMD660 despite its lack of XLR inputs. phew, good to hear. I ordered the sony a couple of days ago, but wasn’t entirely convinced I got the best recorder for my money. I mean, the Marantz is like 100 bucks cheaper, and if it was just as good, then man… hate to throw hard earned cash in the lake. but this new review sets me at ease a little. I have the Marantz PMD620, plus a really good office recording setup, plus the HHB FlashMic. I think the key to the PMD620 is that it’s a very good portable recorder for spoken voice. Not as good as the FlashMic, but noticeably better than the Zooms. In some cases I think it’s likely to be a BETTER choice than the Sony device. If you are going to be recording music, or you’ll mostly be using an external mic, then the Sony is by all accounts the better solution (as Brad has noted). 3. the internal mics actually have a good recording quality (from what I can tell from samples they are better or the same as the Sony’s internals). Together these 3 factors make a compelling case for the PMD620 for the right person. Good quality recording with fewer wind/handling noise problems is a big plus. The size is also a plus. However, if you want to record music, or use with an external mic most of the time, then the Sony seems the way to go. It really seems to depend on your needs. For me, the PMD620 is something I ALWAYS have with me “just in case” something interesting pops up in daily life that I want to capture. The combo of portability and quality has proven to be very useful. Thanks for the link, Brad. We plan to have Mark Nelson’s eighth (!) portable recorder review online this week; this next unit looks like a really strong contender. I love the way Mark turns each review into a story, either taking us along to a Hawaiian luau or some outlandish folk music festival. He shares some more anecdotes in the podcast interview we did a while back. To echo Matthew’s point, I always keep a stereo voice recorder in my pocket. I’ve captured some great moments just because it was there. And the quality is good enough for many productions when I mix the recordings behind other elements.